Sanitary Sewer - A sanitary sewer includes; pipes, lift stations, sewer lines and manholes in the wastewater collection system. 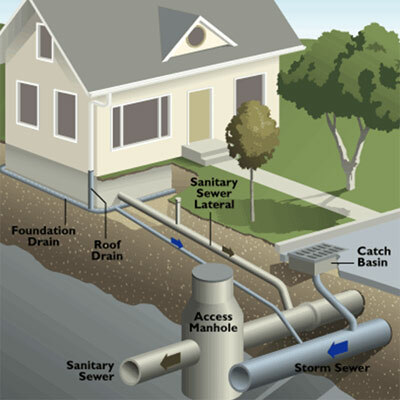 The purpose of the sanitary sewer is to convey municipal sewage and all wastewater to a wastewater treatment system. If a pipe conveys water which needs to be treated, it is a sanitary sewer. The Village of Spencerport has 24.3 miles of sanitary sewer and 579 sanitary manholes. Where does the responsibility of the homeowner lie in regards to the sewer lateral? The homeowner is responsible maintaining a clean sewer line from the house to the main line. Lateral repairs and or replacement are the responsibility of the homeowner. Contact the DPW when the required repairs are in the Village right of way. Is it illegal to connect any downspouts, sump pumps or overflows to the sanitary sewer? Yes! All of the above should be connected to the storm sewer because this extra flow overloads the treatment plant with water that does not need to be treated. Residents are advised to call their private plumber to rectify their problem. Will I be billed for sewer when I fill my swimming pool? Yes. You will be billed for sewer on the water you use, your bill is determined by the amount of water that you run through your water meter. The DEC law states that pool water is considered contaminated water (gray water). Pool water contains chemicals that should be emptied directly into the sanitary sewer to be treated properly and not emptied into the lawns or storm sewer. What happens if the sewer main is across the street? It is the homeowners’ responsibility to maintain the lateral to the main even if it crossed the street. If your road is a state road (Nichols St or Union St) or a County road (Lyell, Canal or Big Ridge) you must check with the correct municipality to get the permits and requirements that they call for.